Todd Bol, a member of Rotary Clubs International, started Little Free Libraries in 2009. Taking inspiration from Miss Lutie Stearns, a librarian who brought books to nearly 1400 locations through “traveling little libraries”, Bol developed the idea for “Take a book, leave a book” collections in coffee shops and public spaces. He saw them as a way to promote literacy and a love of reading and build a sense of community as people shared skills, creativity and wisdom across generations. The Little Free Library Foundation now has over 50,000 Little Free Libraries sharing 36,500,000 books a year. 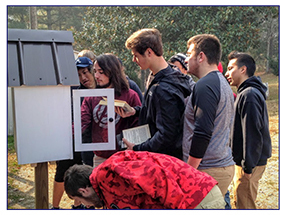 In 2014, Fontana Regional Library, in cooperation with Friends of the Library groups, Read2Me, and many other community members, began to place Little Free Libraries (all registered with The Little Free Library Foundation) in our own communities. The first was in Franklin Town Hall. There are now Little Free Libraries located in several communities through our three counties.